Definitely, an informative course and I had a several take-aways that I plan on implementing immediately. It was nice to hear about a different side of coaching that doesn't get touched on very often but I definitely agree with. Absolutely fundamental training for coaches. 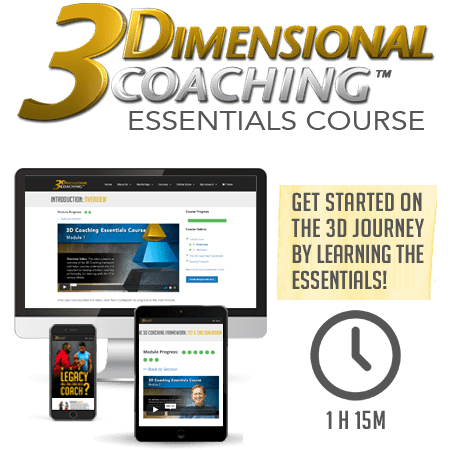 This course opened my eyes to how I influence my athletes, and how I can come along side them and help in their development on three equally important levels. A must for every coach who loves his/her athletes. Great course. So many things that are missing in coaching today. It does a great job of explaining some of the concepts behind the behaviors of young student athletes in today's world. Material is just right! This gives me just what a need as a new coach wanting to speak love and life into the lives of my players and even other coaches! Great introduction to deep truths about coaching and the dynamics of a team. Made me really excited to the full course. Jeff, Mark and Wes are so engaging and empathetic. Thank you! this course is a great stepping stone for future courses of your i would look to look into. Received much helpful ideas to improve my coaching. Great and positive intentional way to coaching! Out with the old style of transactional coaching and in with the new style of transformational coaching! Really caring and understanding your players is a great way to coach! Mark Hull hit almost every nail on the head! A lot of light bulbs went off on some issues with motivation I had been having with my young girls team. Now I know to go back to finding the "joy" in playing the game of basketball and take the pressure off to be successful. Great courses! I am sure to rewatch several of the modules to implant it to memory! I enjoyed the course, it had some really good points and coaching tips. I especially liked the "tag" drill. Most of these core principles will help anyone who applies them to daily LIFE...not just in coaching. Really changed my perspective about how to try to achieve greatness from these kids...not on the field but off! Excellent course! This should be a mandatory for coaches, especially first time coaches.